If you have fallen behind on your mortgage and your lender has threatened to foreclose on your home, bankruptcy may be able to stop the foreclosure and make your mortgage payments more manageable. At Florida Law Advisers, P.A. our foreclosure defense attorneys have helped many homeowners prevent a foreclosure and lower their monthly payment by filing for bankruptcy. Bankruptcy is a useful tool, but it may not be the right solution for everyone. To find out more about how bankruptcy can prevent a home foreclosure, contact us to schedule a free consultation with a Tampa bankruptcy lawyer at our firm. During the consultation a bankruptcy attorney will review the facts of your case and help develop a comprehensive solution to solve your financial problems. Filing for bankruptcy will stop any home foreclosure action by your lender under the automatic stay provision of the U.S. Bankruptcy Code. When you file for either Chapter 13 or Chapter 7 bankruptcy, the court will automatically enact a stay. The stay requires all collection actions against you to stop immediately. Creditors and collection agencies will not be able to contact you, garnish your wages, or repossess your property while the automatic stay is in effect. The automatic stay may even put a stop to a scheduled foreclosure sale of your home. In most cases, the automatic stay will remain in effect until your bankruptcy case is discharged. The automatic stay can help provide a homeowner with more time to catch up on their mortgage or to fight the foreclosure in court. Chapter 13 is a reorganization bankruptcy, it gives you the opportunity to reorganize your debt into a more manageable payment. In addition, it may provide you up to 5 years to catch up on missed mortgage payments without being charged additional interest from your lender. Chapter 13 may also allow you to remove a second mortgage from your home. If you have two mortgages on your house and your primary mortgage exceeds the current market value of the property, you may be able to remove the second mortgage in bankruptcy. Once the mortgage is removed from the property it will be treated like any other unsecured debt in the bankruptcy process. Bankruptcy is not the only way to prevent a home foreclosure. 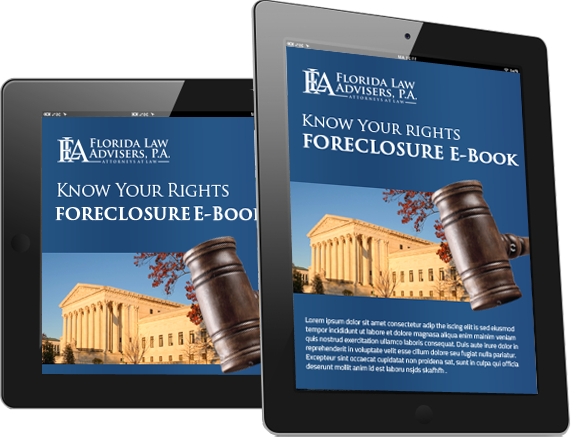 At Florida Law Advisers, P.A., our foreclosure defense attorneys can fight the foreclosure and legally challenge the lender’s right to foreclose on your home. Our experienced legal team will carefully scrutinize every aspect of your mortgage to find any potential evidence we can use against the lender. We will dedicate all of our legal knowledge and skills in the courtroom to help prevent the foreclosure and keep you in your home. At Florida Law Advisers, P.A., our Tampa foreclosure defense attorneys have years of experience helping people just like you to solve their financial problems. We understand that these are very difficult times for you and we are here to help. We have many options available that can help you successfully manage your debt and regain your financial health. The right course of action will depend on the unique circumstances of your case. To see which options may be available to you, contact us to today to schedule a free, confidential consultation with a Tampa foreclosure defense lawyer. During the consultation an experienced Tampa foreclosure defense attorney will carefully review the facts of your case and help you choose a course of action that is best for your individual needs.